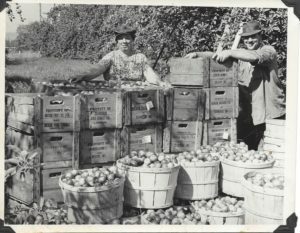 In the early 1940’s Mabel Lambe (nee Doran) began selling home-grown apples from her garage on Highway 26 in Meaford, Ontario. With the success of her apple-selling venture, Mabel enlisted the help of her daughter-in-law Grace (nee Almond) to add home-baked apple pies to be sold at the roadside fruit stand. This small entrepreneurial act launched the Grandma Lambe’s we know and love today. With Mabel’s passing, the legacy and title of ‘Grandma Lambe’ passed to Grace in 1982. Despite this heartbreaking loss, the family set out to see Mabel’s vision grow and prosper. The venture eventually outgrew the small garage and Grace’s husband, Gordon was called upon to build a standalone store. The new store, dubbed by family and locals as the ‘Fruit Stand’, was built in its present location in 1984. 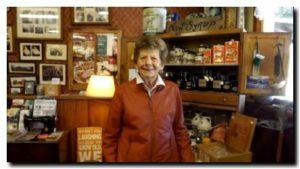 Grandma Lambe’s opened year-round in 1992, and the store has expanded four times since to accommodate the growing business. Meanwhile the farm was also growing. Mabel and husband, Hartley’s orchard began at a modest 10 acres, and grew to 75 acres by the end of the 1940’s. Hartley and Mabel, and eventually Gordon, Grace, and son David operated the orchard, as well as a small livestock operation. The Lambe family has been a part of the historic St. Vincent Township and the Municipality of Meaford for generations. Grandma Lambe’s has been a part of the Meaford Harvest Craft Show since its inception in 1983. Grandma Lambe’s is an integral part of the community and has formed an endless array of partnerships and bonds with other local businesses and families over the years. Grandma Lambe’s is first and foremost a family-run operation. Grace and Gordon’s three children, Barbara, David and Darlene have all played a role in the growth of the Grandma Lambe’s enterprise since its early years. Though Gord and Barbara have passed away, new generations of the Lambe family, including Blake, Cailey and Heather, have joined the fold to help run the farm and store. To this day, Grace continues to oversee the entire operation and can be found at a Grandma Lambe’s in Meaford 7 days a week, 362 days a year. Learn more about the history of the Lambe family and Grandma Lambe’s watch this video.